Up on the blog today we have guest blogger Alice Robertson of Tidy Home here to give Interior Design tips for creating the Perfect Home Office. Working from home is something many of us dream of. Creating our own hours and working from the comfort of our own refuge is, after all, something to aspire to. However, when those homes are small, finding room for office space can be difficult. If you're struggling to create the workspace you need, follow these steps and make your ideas a reality. If you are short on room, you may need to rethink the layout of your living space. You want your furniture to allow for the most open space possible so you can fit in a work desk without feeling like you're suffocating. For many of us, this may be difficult to visualize. It can take trial and error, moving our couches and media stand to configure a pattern that works well. If you feel stuck or simply need a bit of help, consider contacting an interior designer, such as Tina Delia of delia-designs.com located in Philadelphia, PA. An interior designer can give guidance to create the perfect space, no matter how limited it is. Unfortunately, furniture can take up more space than we have to offer. Thankfully, there are ways to get around this. For instance, you could use a built-in desk, which take up less room and are more adaptable to tiny living areas than bulky, freestanding ones. They are customizable, and you can add as much storage as you need to them. Other options come in the form of rollout desks. These allow you to transform your room when you need to work, while simultaneously keeping an open plan for when the workday is done. A smart television can act as a monitor for your computer when you need to catch up with clients, but also let you browse your favorite channels in the evening to relax. Even converting a wall into a large chalkboard can help when it comes to creating a brainstorming space that can be reused time and time again. Think about the space you have on hand and how your furnishings can adapt to it. If your living room is just too tight and you have no spare space in your bedroom, you may have to get creative. 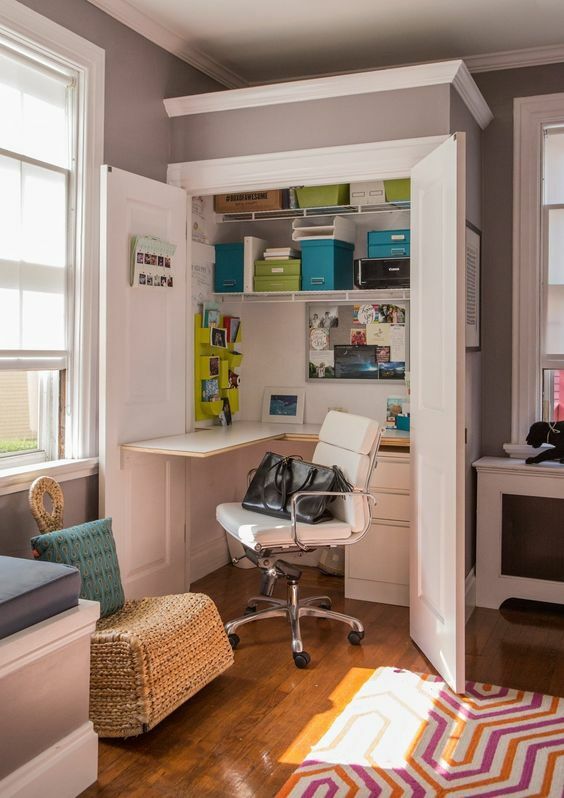 If you have a closet, you can convert it into a fully functional workspace. It's a relatively straightforward process, but does take time and some basic construction. You can purchase or build a small desk that fits inside the closet, and add some storage above the desk to house your supplies and leave your desktop clear for work. 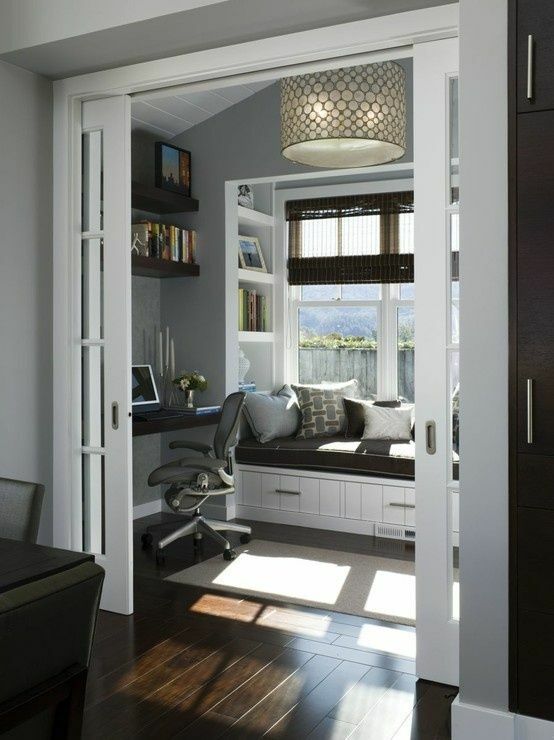 By keeping the closet doors intact, you can maintain a defined barrier between your bedroom and your workspace, which can help you relax at the end of the day and disconnect from work. Look around the internet for inspiration, or reach out to Tina Delia. There are lots of examples to choose from to help you decide what will work best for your home. Designing and creating the perfect office requires a budget. You don't want to sacrifice quality, so you may need to take a bit of time to save up. However, many of us don't have the option of waiting, so when that’s the case, look to non-traditional sources to get what you need. A flea market, secondhand shop or discount website may have a desk you can adapt to your space, and websites such as Craigslist or Facebook Marketplace might also have discounted and gently-used furnishings. Think of non-traditional materials as well for desks, such as laminate, to take advantage of extra savings. There are ways you can adapt your home to make the office you need and want. No matter how small your space, you can create a productive office environment.